Kitchen is that place where we cook the delicious foods. And to be honest I am the foodie one. So for me the kitchen has to be well decorated so that I can cook delicious foods. So the first thing we have to keep in mind while decorating the kitchen is “floor”. The floor of the kitchen has to be gorgeous. Many people does nt care about the look of the kitchen but for me it has to be the perfect one. Kitchen flooring might need to be practical and hardwearing, but there's no need for it to be dull. As kitchens often blend with dining areas into larger, open-plan spaces, the floor can be a great way of uniting different areas of the room, creating a cohesive finish. It's a good idea to choose your floor at the same time as your cabinetry, putting together a palette of colours and materials. 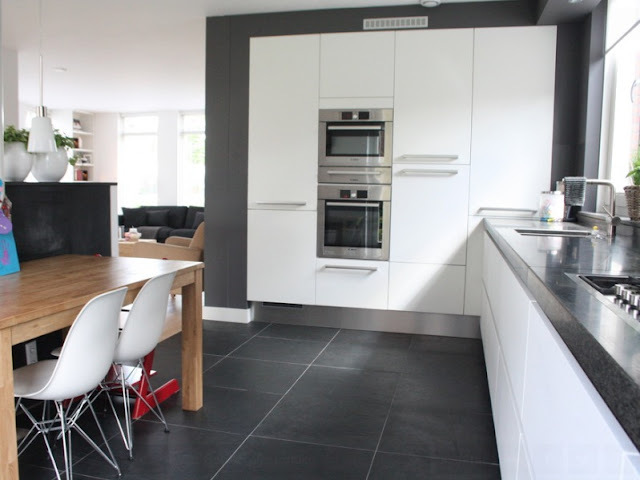 Kitchen flooring is important to think carefully about – after all, the kitchen is usually the busiest room in the house. You might choose neutral tiles in large formats, or those with pattern and texture to add a burst of colour to your kitchen flooring. Patterned and shaped tiles can be used to create a feature floor, or to ‘zone’ an area, such as underneath a dining table. Natural colours and worn-in, aged looks are ideal for a vintage patchwork effect, while parquet patterns in stained and textured timbers are a modern take on this traditional and elegant floor. Natural materials such as stone and wood flooring is always a popular choice and lends authenticity to a scheme. A current trend is ‘mimica’ porcelains, which re-create the look of natural materials.The beauty of going for authentic limestone flags is that they add character to the kitchen. Laid in a mix of sizes for a relaxed country look, they are complemented by kitchen units painted in stone and a farmhouse table with a drawer. Luxury vinyl in the kitchen can feel softer, warmer and more comfortable underfoot than wood or tiles, and it is designed to be durable and low maintenance. Here, Noche Travertine recreates the look of stone, finished with Concrete Pale stripping to divide the tiles and create a feature finish. Looking for the toughest floor covering for your kitchen, that is also effortlessly cool? Opt for polished concrete. Perfect if you’ve got an extremely uneven floor surface, as you simply concrete over. It’s also extremely low maintenance, hardwearing, and can help reflect light around the room. Wooden floors are a great choice for kitchens and kitchen-diners, provided they are treated so that they are resistant to spills and stains. A dark stained floor, sealed properly, looks fantastic when paired with white walls and high, airy ceilings. Classic granite tiles will suit all styles of kitchen, and are great for live-in kitchens that might see a lot of spills. Durable, hardwearing, stain-resistant and easy to clean, it’s the perfect material for family homes. Nod to a feature floor without being too over the top with a delicate parquet floor pattern. Parquet can be installed directly over concrete, and once sealed is a breeze to clean. Either go wall-to-wall for a uniform look, or pick out an area, like in this cream traditional kitchen. 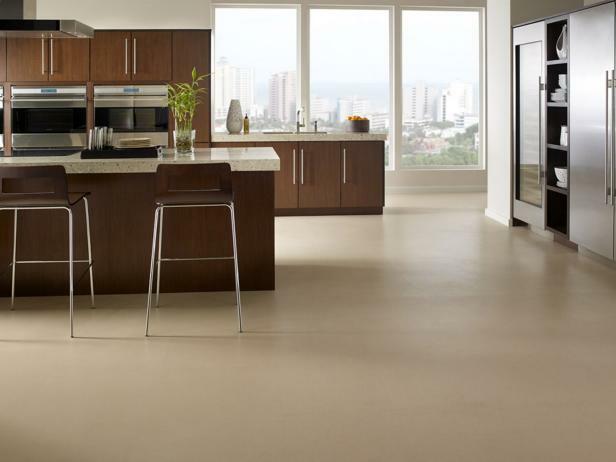 Brick might not be the first material that comes to mind when it comes to kitchen floors. However, being incredibly durable, slip-resistant, and incredibly easy to clean when sealed, it’s perfect for busy family kitchens, and homes with pets. Laminate isn’t just a cost-effective flooring option – modern laminates can come with a guarantee for 25 years or more, are super-durable and can be used with underfloor heating. This warm gloss finish contrasts perfectly with the monochrome cupboards and chairs. 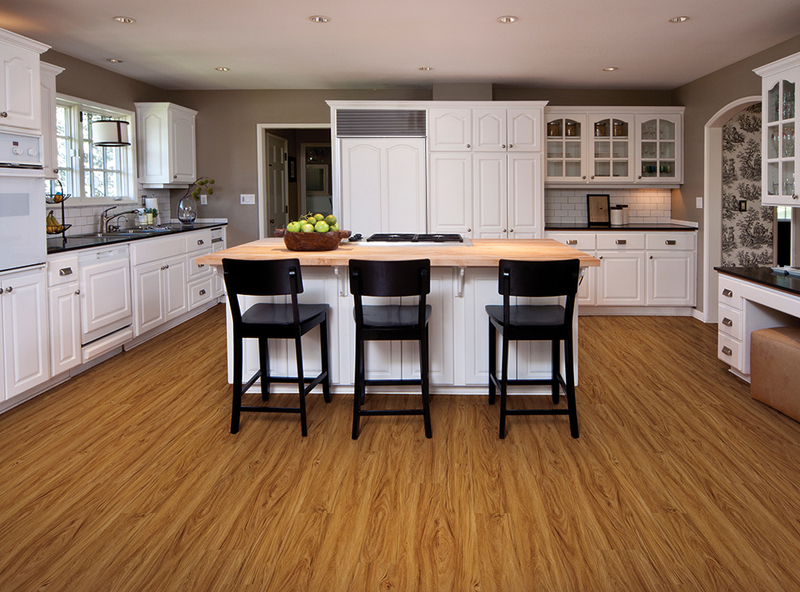 For a smooth, seamless aesthetic in your kitchen, try poured-resin floors. Made from polyurethane resin or biopolymers, the liquid mix is poured over the floor and left to set, creating durable, waterproof, easy-clean flooring, which works particularly well in large open-plan areas.